104 Marlborough is located on the south side of Marlborough, between Clarendon and Dartmouth, with 270 Clarendon to the east and 106 Marlborough to the west. 104 Marlborough was built ca. 1866 as the home of hardware merchant Albert Fleetford Sise and his wife, Edith (Ware) Sise. They previously had lived at 26 Chauncy. Albert and Edith Sise assembled the land for 104 Marlborough in several transactions. 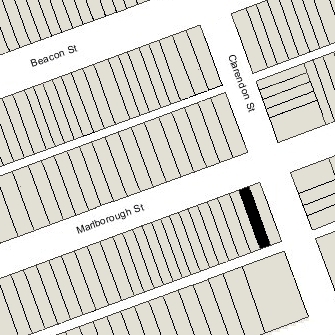 On November 8, 1865, he bought the lot at the southwest corner of Clarendon and Marlborough, with a 30 foot frontage on Marlborough, from the Commonwealth of Massachusetts. The next day, he entered into an agreement with William Thomas, owner of the 50 foot wide lot to the west, specifying that, for the next twenty years, no building of more than eight feet in height could be built in the rear areas of either of their lots (encompassing what would become 270 Clarendon and 104-106-108 Marlborough). On the day after that, Edith Sise purchased a 10 foot wide lot from William Thomas, adjoining Albert Sise’s lot to the east, and on November 21, 1865, Albert Sise transferred the western 9 feet of his lot to his wife. The Sises then built 104 Marlborough on that 19 foot wide lot. Albert Sise retained the eastern 21 feet of his lot as vacant land until August of 1873, when he sold it to Dr. James Read Chadwick, who built his home at 270 Clarendon. Click here for an index to the deeds for 104 Marlborough. 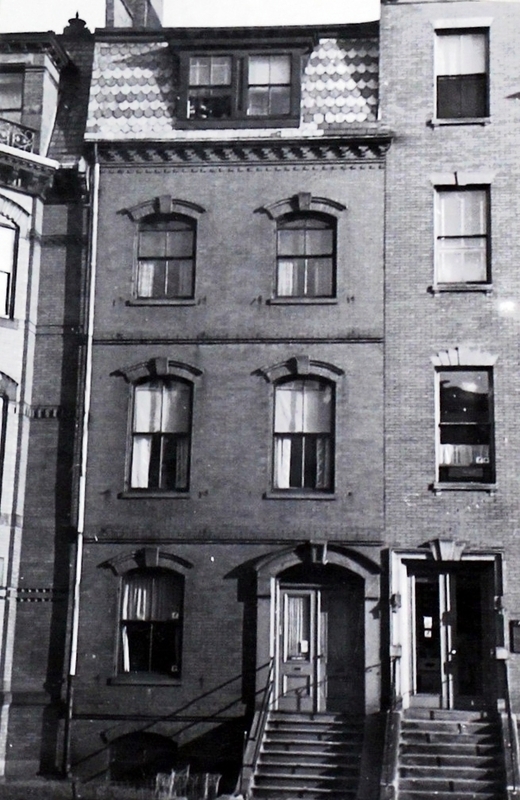 The Sises continued to live at 104 Marlborough in 1871, but had moved to Medford by 1872. On March 20, 1873, 104 Marlborough was acquired from Edith Sise by Horace John Hayden. He and his wife, Harriet (Putnam) Hayden, made it their home. He was general freight agent for the Boston and Albany Rail Road. They had married in October of 1872 and probably had lived briefly thereafter in Kansas City, Missouri, where he had been general freight and ticket agent for the Missouri River, Fort Scott, and Gulf Railroad. Horace Hayden’s brother, Dr. David Hyslop Hayden, a physician, lived with them at 104 Marlborough and probably maintained his medical office there. He previously had lived and maintained his medical offices at 60 Chambers. David Hayden married in September of 1876 to Elizabeth Cabot Blake. Soon thereafter, they moved to 285 Clarendon, which had been Elizabeth Blake’s family home (her mother, Ann Hull (Blake) Blake, had died in 1873 and her father, George Baty Blake, had died in 1875). Horace and Harriet Hayden continued to live at 104 Marlborough in 1880 but moved soon thereafter, probably to New York City (he joined the New York Central Rail Road in 1880). He continued to own 104 Marlborough and lease it to others. By the 1880-1881 winter season, 104 Marlborough was the home of carpet dealer Arthur B. Lovejoy and his wife, Grace (Cheever) Lovejoy. They previously had lived in Salem. They continued to live at 104 Marlborough during the 1882-1883 season, but moved thereafter to Sharon. By the 1883-1884 winter season, 104 Marlborough became the home of Robert Grant and his wife, Amy Gordon (Galt) Grant. They also maintained a home in Nahant. Robert Grant was a lawyer and would later become a probate court judge, He also was a well known and prolific author of novels. Robert and Amy Grant had married in July of 1883. Prior to their marriage, he had lived with his father, Patrick Grant, at 14 Commonwealth. His father’s commission merchant business failed in 1883. He sold his house at 14 Commonwealth and moved to 104 Marlborough with his son and daughter-in-law. In his autobiography, Fourscore, Robert Grant indicates that he and his wife purchased 104 Marlborough. However, it was first rented by the Grants from Horace Hayden, and then purchased from him on June 25, 1886, by Patrick Grant, as trustee under the will of his daughter, Anna Mason (Grant) Lyman, the wife of Charles Frederick Lyman. Robert Grant describes 104 Marlborough as “a snug little house, which looked as if it would accommodate comfortably fewer than it did.” He notes, “My father, the one chiefly to be considered, had a large room to himself on the second floor; we sheltered four maids and employed a chore man. Our range of expenses for the first four years was from $6500 to $7500, without life insurance, and we paid our bills invariably by the tenth of every month.” He also notes that his father shared the expenses. Patrick Grant died in October of 1895. Robert and Amy Grant continued to live at 104 Marlborough until 1898, when they moved to a new home they had built at 211 Bay State Road. The house continued to be owned by the trustees under Anna Mason (Grant) Lyman’s will. 104 Marlborough was not listed in the 1899 and 1900 Blue Books. By the 1900-1901 winter season, it was the home of Francis Bacon Sears and his wife Mary Elizabeth (Sparhawk) Sears. They had lived in an apartment at 220 Marlborough in 1899. They also maintained a home on the Old Boston Road in Weston until 1906, when it was destroyed by fire. Francis Bacon Sears was a banker and also served as treasurer of several cotton mills in Georgia and South Carolina. The Searses continued to live at 104 Marlborough during the 1905-1906 season, but moved thereafter to 284 Marlborough. On April 30, 1906, 104 Marlborough was purchased from Francis C. Welch, successor trustee under Anna Mason (Grant) Lyman’s will, by Dr. James Jackson Putnam, a neurologist. He and his wife, Marion (Cabot) Putnam, lived next door at 106 Marlborough. 104 Marlborough was not listed in the 1907 Blue Book. 104 Marlborough became the home of Dr. Putnam’s sister, Elizabeth Cabot Putnam, who previously had lived at 63 Marlborough with her other brother, Dr. Charles Pickering Putnam. It also was the home and medical office, first of Dr. H. M. Swift (in 1907) and then Dr. Walter E. Paul (from 1909 through 1923). Several shorter-term lodgers also lived at 104 Marlborough with Miss Putnam and Dr. Paul. James Putnam died in November of 1918. After his death, 104 and 106 Marlborough were transferred to a trust established in his will, with Marion Putnam’s brother, Frederick P. Cabot. and brother-in-law, Arthur Lyman (husband of Susan Channing Cabot) as trustees. Marion Putnam continued to live at 106 Marlborough. Elizabeth Cabot Putnam continued to live at 104 Marlborough until her death in October of 1922. Dr. Paul continued to live there in 1923, along with Miss Hamlen, but both moved thereafter. On June 11, 1923, 104 Marlborough was purchased by attorney Charles Henry Fiske, Jr. He and his wife, Mary Duncan (Thorndike) Fiske, made it their home. They previously had lived in an apartment at The Colonial at 382 Commonwealth. The Fiskes lived at 104 Marlborough during the 1923-1924 winter season. Their daughter, Cornelia Robbins Fiske, lived with them until her marriage in April of 1924 to Thomas Wentworth Storrow, a stockbroker; after their marriage, they lived in Readville. By the 1924-1925 winter season, the Fiskes were living in Weston and 104 Marlborough was the home of the Misses Katherine Lyman Thomas, Alice Lee Whitridge Thomas, Rosamond Whitridge Thomas, and Elizabeth (Betty) Thomas. They were the daughters of architect Douglas Hamilton Thomas and his wife, Bessie Lyman (Chadwick) Thomas. They previously had lived at 288 Beacon. They continued to live at 104 Marlborough during the 1926-1927 winter season, but moved to 5 Brimmer soon thereafter. By the 1927-1928 winter season, the Fiskes were living at 104 Marlborough once again, but were shown as “abroad for the winter” in the 1928 Blue Book, and Arthur Wellington Bell and his wife, Marion Hiller (Fenno) Bell, lived there for 1927-1928 winter season. They previously had lived at 450 Beacon with her parents, Edward Nicoll Fenno and Ellen Marion (Bradlee) Fenno. He was a retired investment banker from Pittsburgh and later would become an author. They also maintained a home in Falmouth. By the 1929-1930 winter season, they were living at 72 Beacon. The Fiskes lived at 104 Marlborough during the 1928-1929 winter season, but by 1930 had made their home in Weston their year-round residence. They continued to own 104 Marlborough and lease it to others. During the 1929-1930 winter season, 104 Marlborough was the home of Mrs. Margaret Mallay (shown as Mrs. Margaret Malley in the City Directory). By the 1930-1931 winter season, 104 Marlborough was the home of Admiral William Sowden Sims and his wife, Anne (Hitchcock) Sims. They previously had lived at 26 Brimmer, and before that at 194 Beacon. Admiral Sims was former president of the Naval War College. During World War I, he was in command of all US naval forces operating in Europe. His account of the naval effort during the war, The Victory at Sea, won the Pulitzer Prize in 1921. On June 5, 1931, 104 Marlborough was acquired from Charles Fiske by Gilbert Russell Payson, Jr., and Edward R. Lowry, Jr. They continued to lease the property to William and Anne Sims, who continued to live there during the winter seasons through 1935, but had moved to an apartment at 6 Arlington by 1936. He died in September of 1936. 104 Marlborough was not listed in the 1936 and 1937 Blue Books, nor in the 1935-1937 Lists of Residents. By 1938, 104 Marlborough was the home of Howard A. Cronk (born Howard Crawford Cronk), a commercial artist, and his wife, Alice Ruth (McKechnie) Hutchins Cronk. They operated it as a lodging house. They previously had lived at 151 Park Drive. On May 2, 1939, Edward Lowry sold his interest and the property was transferred to Gilbert Payson, George C. Abernathy, Jr., and Richard W. Hale. Gilbert Payson lived in Brookline, George Abernathy in Wellesley, and Richard Hale in Dover. On January 2, 1941, 104 Marlborough was purchased from Messrs. Payson, Abernathy, and Hale by Dr. Louis Burton Dennett and his wife, Inez Adelaide (Heilbrun) Dennett. They lived in Wellesley. He was a dentist and owned 106 Marlborough, where he had maintained his offices since about 1933. The Cronks continued to live and operate a lodging house at 104 Marlborough until about 1943. By 1944, the Dennetts had made it their home. The Dennetts continued to live at 104 Marlborough in 1949. By 1950, they had moved to 106 Marlborough, where he continued to maintain his office, and 104 Marlborough had become the home of Inez Dennett’s sister, Mrs. Grace Margaret (Heilbrun) Nolan, the widow of Edmund Patrick Nolan, and their son, Robert L. Nolan, a student. They previously had lived in New Hampshire. In about 1955, the Dennetts moved back to 104 Marlborough to live with Grace Nolan and her son. Robert Nolan married in June of 1955 to Jean M. MacDonald. 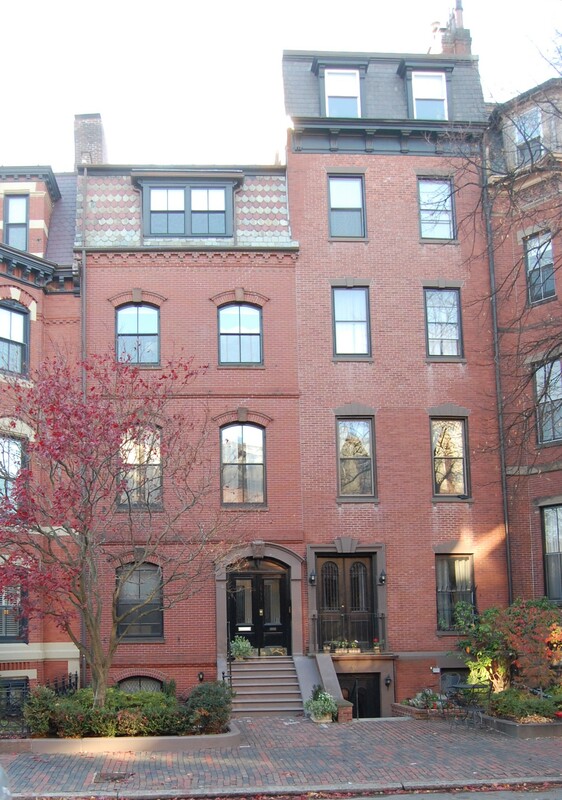 After their marriage, they lived at 104 Marlborough with his mother and the Dennetts. The Dennetts and the Nolans continued to live at 104 Marlborough until about 1958, when Dr. Dennett retired and he and his wife moved to Lakeville. On July 22, 1958, 104 Marlborough was purchased from the Dennetts by Bernard Samuel Schwartz and his wife, Bessie G. (Levine) Schwartz. Bernard Schwartz also was a dentist and he made 104 Marlborough his office. He and his wife lived in Brighton. By 1963, he had subdivided 104 Marlborough into two apartments, and by 1967 he had increased the number to three. No record of the change of occupancy appears to be included in the Building Department files. Bernard Schwartz died in June of 1973. On March 14, 1980, 104 Marlborough was purchased from Bessie Schwartz by Durine Alinova (Dieters) Munson, a principal with the Boston Ballet and the wife of architect Thurston Wells Munson. 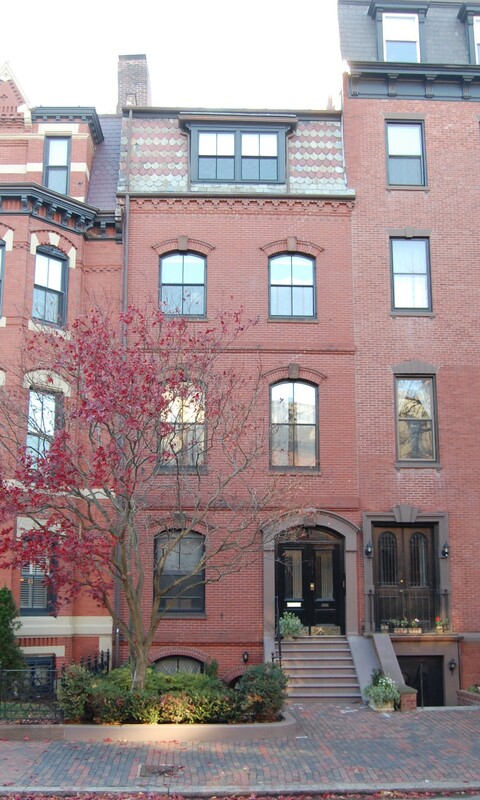 On July 23, 1980, she converted the property into two condominium units, the 104 Marlborough Street Condominium. On July 6, 1983, the number of units was increased to three.